Tá Gaeilge á múineadh ag Gael-Linn le fada do dhaltaí meánscoile agus d’fhoghlaimeoirí fásta chomh maith gnéithe éagsúla de chultúr na hÉireann a chur chun cinn, an spórt, an ceol agus na meáin mar shampla. Tá ranganna oíche á reáchtáil ag Gael-Linn faoi láthair d’fhoghlaimeoirí fásta agus bainfidh na ranganna seo úsáid as uirlisí SpeakApps sna míonna atá romhainn. Ó réimse leathan comhthéacsanna teagaisc a bhí páirteach sa seisiún. Chuaigh simplíocht agus deiseanna Langblog go mór i gcionn orthu. D’fhiafraigh siad maidir leis na deiseanna a bheadh ann Langblog a úsáid ina gcomhthéacs teagaisc féin Meán Fómhair 2012. Bhí áthas ar na rannpháirtithe a fheiceáil go raibh na huirlisí á n-úsáid chun cuidiú le teagaisc scileanna labhartha Gaeilge. Ábhar suntais é go mbeadh na huirlisí go maith d’fhoghlaimeoirí fásta mar ligfeadh sé dóibh a gcuid scileanna labhartha a chleachtadh go haisioncronach nuair a d’fheilfeadh sé dóibh. Chabhródh sé leo freisin aithne a chur ar a bpáirtithe ranga. 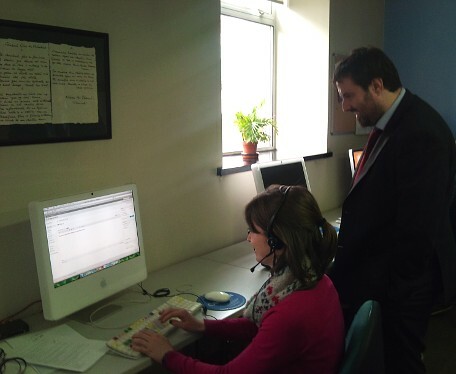 On 13th of April a representative from DCU met with a number Irish language teachers from Gael-Linn to introduce them to the SpeakApps Moodle platform and to allow them to experience using the tools before the tools are introduced to their classes. Gael-Linn have a long tradition of teaching Irish to both secondary school students and adults learners as well as being an organisation which promotes other aspects of Irish culture such as sports, music and media. Gael-Linn currently runs evening courses for adult learners of Irish and some of these classes will be using the SpeakApps tools of the next few months. The people who attended this session came from a variety of teaching contexts. All were very impressed with the simplicity and affordances of the Langblog tool. They asked about the possibility of using Langblog in their other teaching contexts in September 2012. They were glad to see that these tools were being brought in to assist the teaching of Irish spoken skills. It was noted that these tools could be very beneficial to the adults learning Irish in evening classes as it would allow them to practice their spoken skills asynchronously at a time that suits their schedule. It would also help them get to know their classmates better.